This book's origin is a bit unusual, with a think tank inviting authors to speculate about the nature of future warfare in fictional form. Now, I'm not the kind of person who'd ever read a policy report or position paper. And I don't read weapon specs either. I would say (generalizing a bit broadly) that a story based on a scenario cannot work as a story unless it includes moral or social or emotional or in some other way deep aspects of its subject matter, and these aspects must be anchored by the humans in the story. This generalization will help explain why I think many of the stories in this volume failed: they lacked a credible human element. The authors are fairly unanimous in imagining a heavy role for computers and connectivity in their stories (though not unanimous on the nature of that role); for that reason, there's rather more data processing than gunfire in these pages, though the latter is not absent. The best story in the collection, Madeleine Ashby's "A Stopped Clock", approaches the depiction of an act of war very obliquely, without showing any technology, using the point of view of its endearing protagonist, a woman selling food on the street in Korea, to draw a picture first of what living in a completely networked city might be like, and then a closeup view of the city's collapse from a cyberattack. The how, who, why of the attack are not stated; its effect is the only subject of interest. "From a Remove" by Alec Meden is also effective; it centers on a recruit in a destructive fourth world war, a war fought from orbit by remote control, yet with very real human casualties. Her perspective makes the cost visible and allows her to raise questions about what is being prioritized in the battle and the war. 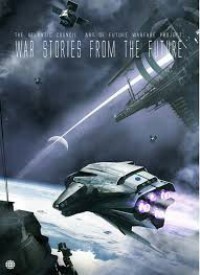 "ANTFARM" by August Cole also has a notable, if not likable, main character; he is the crew of a warplane in a conflict where the feedback between war and the images of it produced for the public reaches a new level, with an experiment in crowdsourcing the plane's goals and tactics by feeding info and images to a large group of civilians who, it is hoped, will provide superior processing power; yet perceptions by various parties differ diasastrously. It's a queasy-making story. The rest of the stories, apart from well-chosen reprints by Linda Nagata and David Brin, are negligible, even one by the usually-reliable Ken Liu. Their characters (if they even have any) are lifeless, and so can't animate the moral dimensions of the story (if any); some simply fail at basic storytelling. Still, I don't complain much if an anthology contains a handful of decent stories.